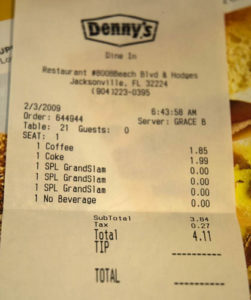 JACKSONVILLE, Florida (February 3, 2009) – Denny’s Restaurants hit a grand slam with the chain’s offer of a free Grand Slam Breakfast to anyone arriving at one of its locations between 6AM and 2PM today (Tuesday, Feb. 3). Web trackers in Los Angeles, Dallas and Seattle reported the company’s site suffered outages today – they suspect from potential customers logging on to find the nearest restaurant. 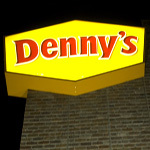 Google reports that five of the top 40 searches on the internet today have been for Denny’s. The 1500-restaurant chain has been in business for 50-years. It claims to be the largest full-service family restaurant in the United States. 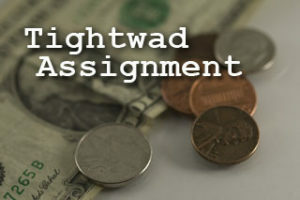 The company says it annually has more than $2-billion in sales and employees about 21,000 people. 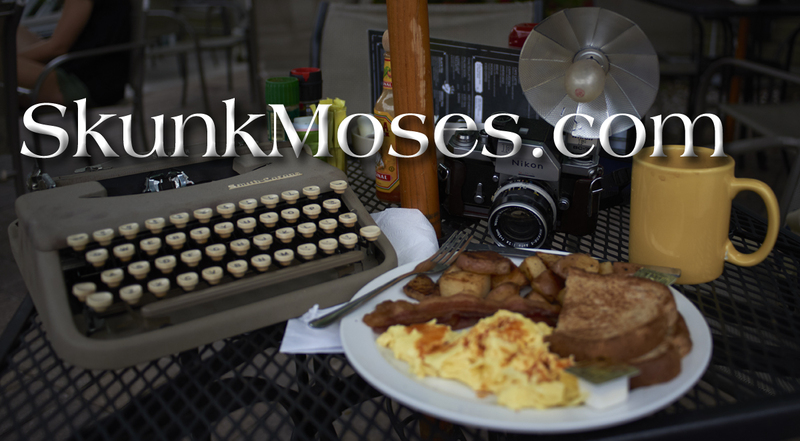 It’s best know for serving breakfast all day, led by The Grand Slam Breakfast – the item the company gave away today. 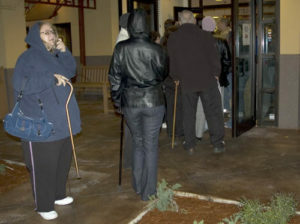 Denny’s on Beach Boulevard in Jacksonville just after 6AM, I found the parking lot full and folks lined up outside. The cold wind blew from the west and people pulled their jackets tight. The wait was about 20-minutes, and while we waited in line, a hostess circulated offering free samples of what they called a Pancake Puppy. The Puppy was a golf ball sized globe obviously dusted in cinnamon and served on a long toothpick. I bit in and found it much like a cake donut. Perhaps not quite as sweet. The hostess said the dish is pancake batter formed into balls, deep fried and coated in cinnamon. I thought it needed to be a slight bit sweeter. Maybe it needed syrup, but I would first try adding a bit of confectioner’s sugar to the cinnamon coating. I went with a friend, and it was so packed, we invited a woman who was there alone to join us. She turned out to be a delightful person. We were seated in the crowded restaurant, and I was surprised at how quickly a waitress (server, whatever) arrived. She was in good cheer but beginning to feel the stress of the mob. She took our orders and disappeared into the crowd. I was again surprised by how quickly she returned with the food. Eggs scrambled just firmly enough, bacon cooked through but still limp, sausage links, and large pancakes. 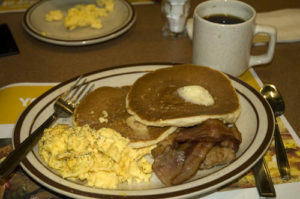 The eggs were just fine, the bacon flavorful, and the pancakes tasty with good texture. They did taste just like the Pancake Puppies and a bit of added syrup indeed, added the sweetness the Puppies lacked. Even with such a crowd, the employees were cheerful and fast. I think they were surprised at the response, but seemed to handle it well. I had not been to Denny’s in a long time. The most convenient restaurant to me requires negotiating the hazards of the new bridge under construction over the Intracoastal Waterway. But the breakfast was good, and I will probably return when the construction is finished. We had to pay for the drinks, so the final bill for three people – $4.11 with tax. Yes, we did leave a tip.